The Gospel Is Not A Neutral Term: An Interview With Rev. Sekou. One of our editors, Jake Dockter, had a chance to connect with Rev. Sekou to discuss Ferguson, faith, and protest. 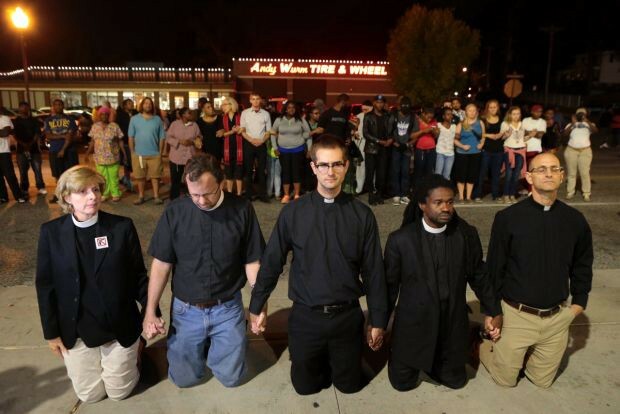 JD: What is your theological basis for being involved in Ferguson? RS: The broader question for me is the tone and tenor of the gospel. I understand the gospel of Jesus as a story about God choosing to become flesh in the body of an unwed teenage mother among an unimportant people in an unimportant part of the world. Jesus — a Palestinian Jewish peasant living under Roman occupation — is the salvation of the world. God in flesh was a subject of an empire. This formulation in Christian mythos sets the stage for how I read social location and political climate. As a black Christian raised in the rural south of the Arkansas Delta, I understand the gospel to affirm black dignity and self-determination. Black Christianity begins with the assumption of black humanity, which is a left-of-center project inside the American empire. The situatedness of the first century Palestinian living under Roman occupation is the same situatedness of black people in America. Thus we must resist in the way which Jesus resisted. We must be present with the least of these as he called and be willing to go to the cross as he did. Anything less is heresy. I understand the gospel to affirm black dignity and self-determination. JD: And how do you see the events in Ferguson? RS: The spark that lit a smoldering flame was the killing of Mike Brown, an unarmed black teenager, by Darren Wilson, a white police officer. But this killing is a symptom of a historical practice of white supremacy exacted on black bodies inside the American empire and aboard. A central feature of these practices is heavy policing and wanton death. From Emmett Till to Mike Brown and the others to come, black folks have been subject to arbitrary policing and state violence since the first African got off the slave ships. Within the historical narrative, Mike Brown’s killing is ordinary and normative. The indignity of leaving his body in the street uncovered for over four hours combined with the highly repressive and violent police response to peaceful protest ignited a protest movement led by mostly poor working class black youth that will not bow down. JD: How do you see the gospel informing your protest? RS: First and foremost, the gospel is not a neutral term. If it is being deployed as a catch phrase for the white evangelical discourse that places a premium on conversion over being against justice seeking, then I reject “the gospel.” It is motivation to resist oppression. If “the gospel” is in line with the reading of the Bible that Sojourner Truth, Frederick Douglas, Will Campbell, and Martin Luther King had then “the gospel” is central to our call in Ferguson. The gospel is not a neutral term. To that end, Walter Wink’s assessment of Jesus as a nonviolent revolutionary committed to organizing the poor in the face of occupation is critical to how I view the role of clergy in Ferguson. The belief that God gives a preferential option to the poor as posited by the liberation theologians is yet another way in which the gospel is interpreted to support our work on the ground. JD: What is the tradition amongst black churches for involvement with protest? RS: The creation of the black church was in protest against white evangelical Christianity, which justified black people’s enslavement. Beginning with Free African Society all the way through the founding of my beloved Church of God in Christ, every black church formation had to contend with, in some form or another, the racist society that dehumanized, demonized, and at times decapitated (literally and existentially) their beings. The creation of the black church was in protest against white evangelical Christianity. While it is a myth that every black church has supported protest movements, it is clear that these congregations played key roles in the civil rights movement. From mass movements to holding funerals for the slain and producing some of the most notable figures in the quest for democracy and dignity, the black church has been a harbinger of black radical religion. JD: What has the response of white churches been? Why do you feel most evangelicals have been largely silent? RS: Jim Wallis, the evangelical leader of Sojourners, captures it best in his essay “Arrested in Ferguson is an act of Repentance”. Wallis forcibly argues: “If white Christians in America were more Christian than white, black parents could feel safer about their children.” At the center of Wallis’ proposition is the fact that white Christians are just as racist as white non-Christians. White folks have always benefited from what W.E.B. DuBois called the “psychological wages of whiteness”. The privilege, power, and policy, which support white supremacy trump faith claims and democratic language. It is also informs the emerging churches lack of critical engagement with racism that tends to opt for liberal notions of colorblindness. The privilege, power, and policy, which support white supremacy trump faith claims and democratic language. In that sense, white evangelicals are thoroughly American. They tend to conceal sufferings, reject difference, encourage consumerism, emphasize individualism and accentuate newness over and against historical systematic structures and ugly history of America. Moreover, the multivalent nature of our movement pushes all of the evangelical buttons. The Ferguson Movement has visible queer leadership. Women are center stage and poor black folks are the critical to keeping the struggle alive in public discourse. Evangelicals have not reconciled their refusal to ordain women, disdain for queer folks, and racist and classist tendencies hinder their ability to submit themselves the leadership of this movement. Yet faith based social justice organizations that are populated with evangelicals such as PICO Network and Sojourners have made quantum leaps forward in this regard. JD: What do we make of the Christians on both sides of the issue, as protestors for and against police? RS: Christianity has always had two dominate strands — imperial and prophetic. The text and tradition was contested and compromised from the inception of Christianity. Much of the writing associated with the Apostle Paul is a compromise with the Roman Empire. The repressive admonitions concerning women’s silence and slave obedience are reflective of the practices of the Roman Empire and were rejected in Jesus’ ministry. Paul’s suggestion that agents of the state are ministers of God undermines much of the resistance that black folks have engaged. However, the black hermeneutic of suspicion navigated the biblical text in such a way that it affirmed their humanity and resistance. Christianity more often than not has served the Empire. Beginning with Constantine’s conversation to Martin Luther’s support of the Catholic Church’s repression of the peasant revolt to segregationist using the biblical story of Ham to justify slavery, the church, writ large, has always been on the wrong side of history. So Christian support of Darren Wilson is par for the course. The church, writ large, has always been on the wrong side of history. Prophetic Christianity, which is on the edges of the tradition but claims the heart of the faith, has rejected the spirit of the Empire and sided with the oppressed. Unfortunately the prophetic tradition is not the popular or dominant strand of Christianity at work in the world today. JD: Can you provide some information on your two recent experiences with police? What happened and what occurred inside the jail? RS: I have been arrested twice in Ferguson. The first time was during the nightly action lead by youth organizers associated with Lost Voices, Hands Up United and Millennial Activists United. During their nightly protest at the Ferguson Police station, local clergy came out to support them and bear witness in solidarity. Clergy knelt and prayed in front of a garrison of police repenting for our silence and supporting the young folks who we followed to the space of resistance and place of injustice. After our spontaneous prayer meeting, young folks asked us to step aside as they stood in the middle of the street willing to risk arrest. The line of police wielding long brown wooden batons and donning riot gear marched lock step toward the young folks in the street. Something got a hold of me. I darted out in between the youth activists and advancing police. I knelt and prayed. I was promptly surrounded by police, snatched up and placed in a blood stained police van but the youth would not back down. I was promptly surrounded by police, snatched up and placed in a blood stained police van but the youth would not back down. For almost two hours the youth sat down in the middle of the street and refused to leave until I was released. Captain Ron Johnson was ushered from his home, and came out to negotiate with the youth. And they were not having it. I was eventually released from the police van. On Moral Monday as a part of Ferguson October, a group of faith leaders were arrested as we prayed and called on the police to repent for being part of an evil system of policing. As an act of resistance we created a memorial for the Mike Browns of America. Rev. Charles Burton, a local pastor and activist, laid down on the soaked ground. His body was traced with chalk and candles lit. Pastors and Rabbis read the unarmed names of those killed by the police. Clergy positioned themselves along the police line to take confession. We, then, advanced towards the entrance of the police station. Police placed batons against a few of our throats, swung wildly at others, but we prayed, raised our voices in song and worship. We moved again to enter the police station to and many were thrown to the ground and arrested. Seventeen of us were charged with assault against a law enforcement officer, along with the blanket charge of disturbance of the peace (ironically, given the ever-present chant off ‘No justice, no peace’). A total of 43 people face charges from that morning alone. JD: How should Christians support the cause? RS: We must show up and shut up. If you have not been here during the early days of the protest standing with the protestors then your job is to simply listen and be present. Also we must choose sides. We cannot be lukewarm. Magnanimity is often a shield of cowardice. Jesus clearly takes sides with the oppressed, and we must side with the youth, Mike Brown, and all of the oppressed. We must show up and shut up. JD: How should those of not in Ferguson support the cause? RS: Show up and shut up, and do it in your own communities. According to the Malcolm X Grassroots Movement 2012 report Operation Ghetto Storm, somewhere in the United States, every 28 hours, a black person is killed by the police. Unfortunately, there will be plenty of opportunities for Christians to show up and sit with the suffering of black people inside the American Empire. So show up in your communities and listen to youth. What churches organized to be open 24 hours a day for youth to organize and be safe? JD: Who are some of the people of faith you have seen on the street? RS: There are a number of folks who have been on the ground since day one. To be sure, the church writ large, showed up late as an organized body but the women have been on the ground since day one. Rev. Renita Lamkin, a white sister who pastors in the African Methodist Episcopal — a black denomination, was on the street holding the line with young people. She was shot with a rubber bullet in the very early days. Now that is the kind of white Christian we need in this work. Rev. Traci Blackmon, Pastor in the Christ the King U.C.C. has used her contacts as a civic leader and relationships to convene national clergy to the city. Rabbi Susan Talve, founding Rabbi of the Central Reform Congregation, has been on the street and has been unfailingly ready to leverage her resources to get young folks out of jail. Lisa Sharon Harper, Director of Mobilizing for Sojourners has recruited, trained, and turned out evangelicals as well. PICO Network (including Rev. Deth Im, Rev. Alvin Herring, Rev. Michael McBride, and Rev. Nelson Pierce) has shown up in a big way — from getting tear gassed to voter registration drives to organizing civil disobedience. One of the interesting things about the Ferguson Movement is that it is largely multi racial, young, queer, and interfaith. This is a major shift from traditional civil rights model. And I am glad about it. One of the interesting things about the Ferguson Movement is that it is largely multi racial, young, queer, and interfaith. JD: What is your prayer for Ferguson? Rev. Osagyefo Uhuru Sekou (@revsekou) is a St Louis native. He attended Soldan High School, began his ministry at the Friendly Temple Missionary Baptist Church and retains strong family ties to the area. He is an author, documentary filmmaker, public intellectual, organizer, pastor, and theologian and currently serves as the Pastor for Formation and Justice at the First Baptist Church in Jamaica Plain, Boston, MA. Sekou has just returned from a summer as a Scholar in Residence at the Martin Luther King Education and Research Institute at Stanford University. He has been on the ground for most of the past two months on behalf of the Fellowship of Reconciliation (the country’s oldest interfaith peace organization), assisting with organizing efforts in conjunction with local and national groups. Rev. Sekou served as youth pastor at Friendly Temple Missionary Baptist Church in Saint Louis between 1993–96, taught alternatives to gang violence at Stevens Middle School, and directed the Fellowship Center in the Cochran Housing Project in the city. In 2006, the Institute for Policy Studies appointed Sekou its first Associate Fellow in Religion and Justice. He is the author of collection of essays, urbansouls, (Urban Press, 2001), a meditation on working with at-risk youth in Saint Louis, hip hop and religion, and Gods, Gays, and Guns: Essays on Religion and the Future of Democracy (Campbell and Cannon Press, 2012). Exploring how our faith, race, justice, and activism intersect. Standing with #ferguson Father, forgive them for they know not what they do. DM for more info. Protest, action, justice, and faith on the streets of America.